There is high demand for Cloud strategy expertise, and it is not surprising given the market adoption of Cloud computing. Cloud computing is entering the early mainstream phase of adoption, which means that it is gaining market share and is widely accepted as a legitimate technology model to pursue by most organizations. However, the dynamics of the Cloud computing marketplace reflect multiple patterns of Cloud adoption. The increased interest in Cloud strategy is due to a number of factors, ranging from initial failure with Cloud to achieving Cloud success, but wanting to build on it. The following descriptions of various Cloud strategy “archetypes” may apply to your organization. An organization believes that good Cloud computing planning will help ensure a better Cloud computing implementation (and results). An organization has already begun Cloud adoption, but feels that greater success will be realized if it goes back and completes the appropriate Cloud planning steps. An organization has struggled with its initial Cloud adoption, and is developing a new Cloud strategy to reset the initiative with plans to overcome the prior setbacks. An organization has achieved Cloud success via a Cloud strategy, and must refresh or renew the Cloud strategy to continue to expand and build on its initial success. An organization is facing an urgent requirement where the consequences of getting Cloud computing wrong are too great. The Cloud strategy is critical. These Cloud strategy patterns reflect how an organization adopts technology in general, how aggressive or conservative it is with the adoption of new technologies, and how mature its strategic planning and execution capabilities are. The archetypes will be explored in detail, and help explain why a Cloud strategy is essential for ensuring Cloud computing success. But first, we must explore the importance of strategic planning. A business strategy is a formally documented plan (we can debate what is formal or not later) that describes how a given organization will achieve its goals via the allocation of resources aligned with goals, objectives, strategies and tactics. A strategy defines what the organization will do, as well as what it will not do, in achieving its goals. A business strategy establishes a vision and operational compass for the enterprise. It guides decision making, investment decisions, capability development, organizational design, and fostering or development of corporate culture. It is quite interesting, however, how immature the strategy development processes are in many Fortune 1000 enterprises and public sector organizations. There are many common reasons why strategic planning is performed so poorly, despite its acknowledged value to organizational performance and sustainment. Time: In Horwath’s analysis, 96% of organizations cite the lack of time for strategic thinking and planning, owing to the lack of resources and more responsibility loaded onto individuals and leaders. Strategy is not viewed as necessary as checking the boxes on the daily to-do list. Commitment: A strategy requires support and buy-in from the entire organization, and even more so from the majority of the team that did not participate in the development of the strategy, but who are involved in its eventual success (or failure). A Harvard Business School study found that 95% of employees in large organizations don’t understand, or are unaware, of their organization’s strategy. Another analysis found that only 20% of team members understand how their job function relates to the business strategy. This is a sad state of affairs, and reflects the mythical exclusivity of strategy development to the corporate strategy elites. Priorities: A strategy helps an organization prioritize what will and will not be done. A strategy must define with equal rigor the choices, trade-offs, and rationale for pursuing a given course of action over another. According to Horwath, 60% of organizations pointed to a lack of priorities at the executive level of their enterprise. A recent McKinsey Quarterly survey found that of nearly 800 executives, only 45 percent were satisfied with their organization’s strategic-planning process, and only 23 percent indicated that major strategic decisions were made because of their internal strategic planning process. This is not a terrific endorsement of strategic planning. However, we firmly believe that a business strategy is a critical tool to enable the desired business performance as defined in the strategic plan. We must now define more clearly what a business strategy is, and how one is generated. Business strategy is the “intelligent allocation of limited resources through a unique system of activities to outperform the competition in serving customers.” Business strategy requires a combination of strategic thinking combined with the discipline of strategic planning. Strategic thinking is an under-appreciated discipline, and most leaders are not encouraged to be strategic thinkers. Strategic thinking is not tangible, despite it being the basis for strategic planning. Strategic thinking is part of the process of strategic planning, which is the structured annual process of defining, refining, updating and improving a given business strategy. Strategic planning is the process of harnessing and converting business insights into an action plan to achieve goals and objectives. For most organizations, the strategic planning process begins in Summer, and is completed in the Fall of a given calendar or fiscal year. The strategic planning process must begin with a decision to devise a new business strategy or update an existing business strategy that is being pursued. A business strategy will have a corresponding IT strategy, and the IT strategy may require a sub-strategy focused on a particular dimension, goal or objective identified in the IT strategy. Cloud computing is assumed to be one of these requirements. Cloud strategy is a subset of the Information Technology (IT) strategy, which is part of and supports the business strategy. Cloud strategy is a formal definition of how resources will be allocated to a Cloud computing initiative, such that Cloud computing can be deployed to deliver differentiated value to an organization’s customers, in many cases internal business customers. However, Cloud is increasingly used to enable and support digital transformation efforts, the business units more and more are planning Cloud computing into products and services, as well as into delivery of those products and services. Cloud is becoming more business driven, hence the need for better and more formal Cloud strategic planning. Cloud strategy also matters because of the dynamic nature of the Cloud computing industry. Overall, Cloud computing is in the early mainstream phase of adoption. This means there are many new entrants into Cloud computing, and many of these new adopters seek a formal definition of Cloud strategy before committing its resources to it. However, the early mainstream phase of Cloud adoption also means that there are many early adopter organizations that are now rethinking their approach, or were early adopters and failed in their initial approach. The illustration below shows where Cloud computing falls on Geoffrey Moore’s version the Technology Adoption Lifecycle (TALC) model. 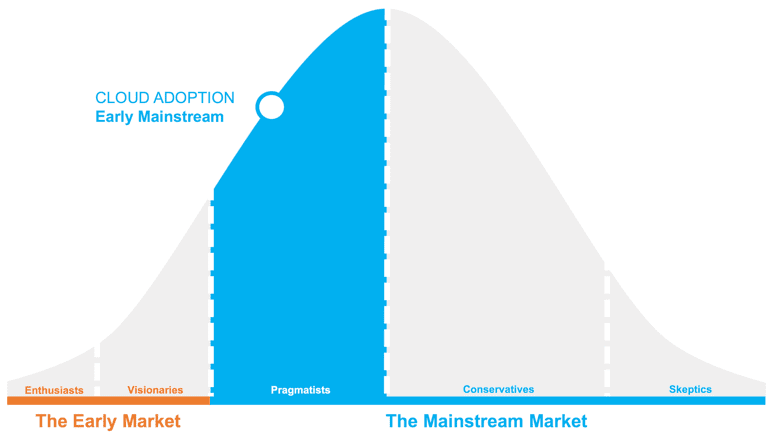 Given the Cloud computing trends, we believe Cloud is in the early mainstream “Pragmatists” phase. This means that Cloud computing is in the adoption inflection point where adoption is accelerating dramatically. The mainstream market Cloud adopters are now beginning to evaluate Cloud computing with serious intent. As an organization considers adoption Cloud computing, there typical adoption phases that are typical. 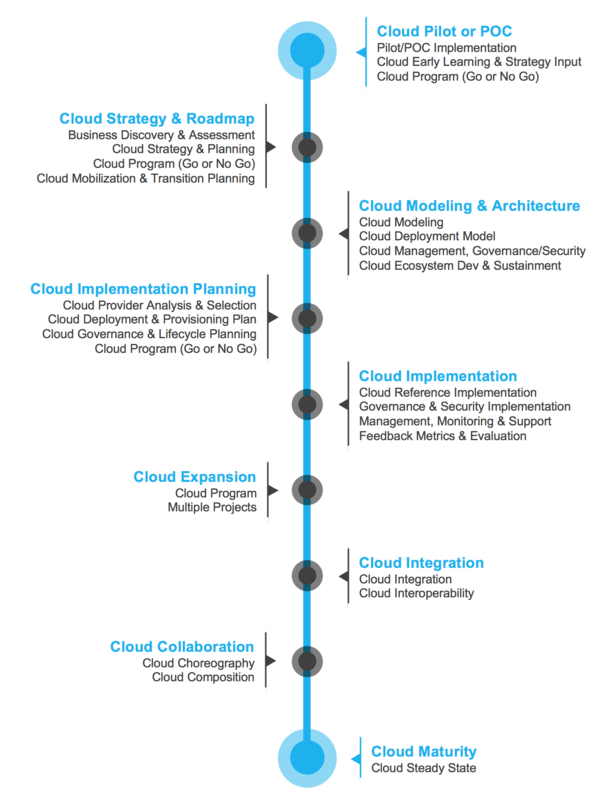 We use the following model to characterize the major stages of Cloud computing adoption. Cloud computing adoption often begins with a pilot project or proof of concept (POC) to prove the technology on a narrow-scoped use case. This early experimentation serves as a test evaluation of the technology, as well as to provide education and knowledge to the technical staff. Once a POC or pilot is completed, these learnings are (or should be) incorporated into a formal Cloud computing strategy development process. Cloud strategy development follows similar stages as a corporate strategy, and results in a formal plan. Often done in parallel with or in support of the Cloud strategy, Cloud modeling and architecture is the process of developing a Cloud reference model and reference architecture, and then modeling the in-scope use cases against the Cloud reference model and reference architecture to inform vendor and technology selection, as well as use case validation. Typically defined in the Cloud strategy, but performed afterward, the Cloud implementation planning comprises both the implementation and/or deployment planning for Cloud, as well as the workforce development and training preparations necessary to be successful with Cloud computing. In this phase, the organization goes “live” with its Cloud computing deployment as defined in the Cloud strategy. This could mean implementing private Cloud technology platforms, moving workloads to a public Cloud provider, or implementing a hybrid Cloud or multi-Cloud environment. It also means implementing Cloud management, monitoring and governance capabilities. During this adoption stage, the legacy portfolio is actively evaluated to migrate selected applications to the target Cloud environment as well. In this stage, Cloud consumption is expanded, and more Cloud services are provided and consumed within the enterprise. More business units are leveraging Cloud computing, and more applications are built natively to exploit Cloud computing. Cloud integration, interoperability and portability should be considered early during Cloud planning and architecture development. This is especially important given that hybrid multi-Cloud environments are the rule today rather than the exception. Interoperability and portability across Clouds is still hampered by differences in Cloud APIs and the lack of industry standards, but these concerns are now being addressed through container technology and containers as a service (CaaS). These are important considerations, and they must be addressed up front during Cloud strategy and planning, as well as during vendor selection and contract negotiations. Once Cloud is optimized and working smoothly, business units and delivery organizations can effectively collaborate on business and IT solutions via the Cloud. In an ideal world, the business and IT collaboration will begin during the Cloud strategic planning process, and carry through the execution. However, in many organizations, the Business and IT collaboration takes time to develop. Cloud maturity means the Cloud strategy is realized, and that Cloud computing is now just part of the technical and operational culture of the organization. It is a standard way of working in this enterprise. The Cloud Adoption Lifecycle is an idealized sequence of steps that many organizations typically follow in their adoption of Cloud computing capabilities. Not all the exact steps are followed by all organizations, nor are they followed in the same sequence. This Cloud Adoption Lifecycle is a reasonable and logical approach for a successful implementation of Cloud computing, and organizations can compare these stages to their actual progress and determine not only where they are, but what they need to do to achieve their goals. However, as we know, many organizations have not followed an ideal path to Cloud computing at all, and thus they fall into one of the five Cloud strategy archetypes that will be discussed in the next blog. In Blog #2 of the Cloud Strategy series, we will explore the various Cloud strategy archetypes that describe the various stages of Cloud adoption that organizations find themselves in. Subscribe to get cloud reports and industry insights. © 2019 Cloud Spectator. All Rights Reserved.